2016 has been an eventful year so far and not likely to get boring anytime soon. Recently I performed at a festival in Dortmund, Germany on July 1st to 3rd. That’s right, exactly one hundred years after the slaughter at the Battle of the Somme. 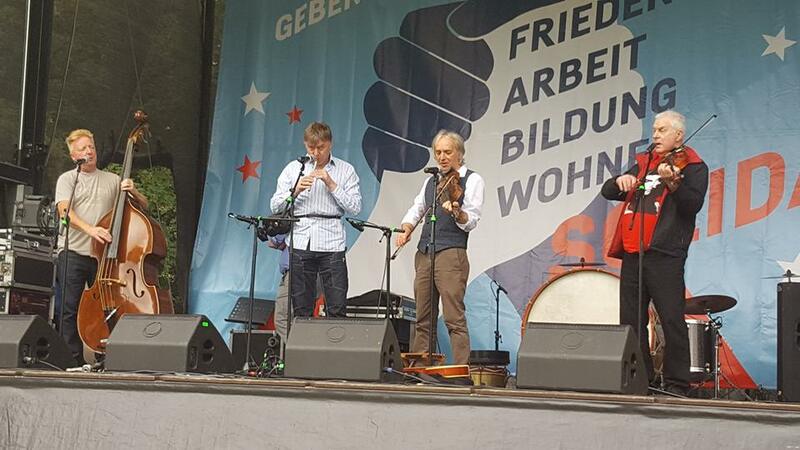 The UZ- Pressefest was brilliant and our Ulster-Scots style music was warmly received by the thousands of festival goers – mostly Germans. 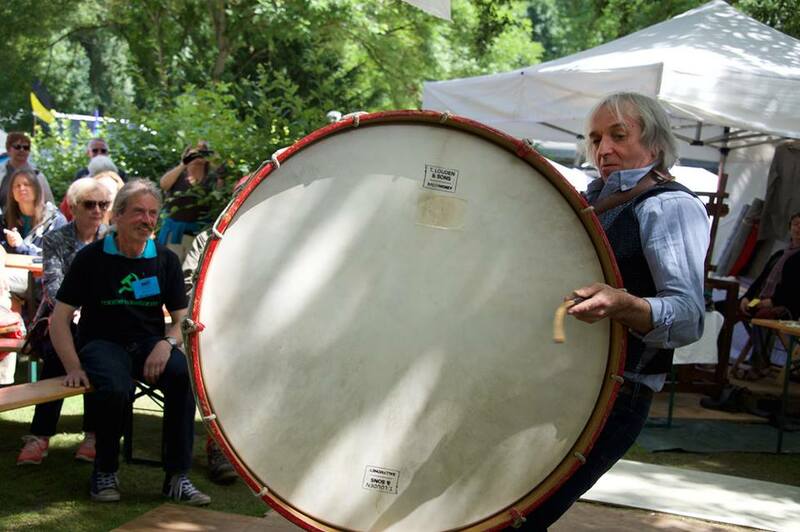 The Lambeg Drum was of course a particular curiosity. One thing we learned, in Germany was that the Battle of the Somme and probably the First World War, and maybe even the second one, are not really commemorated at all. We’ve oft been advised not to mention the war while in Germany but regardless no one gave us grief for making reference to the Somme. The other interesting thing about this biennial folk and food festival was that it was organised by the German Communist Party. Well me, or other band members of the band, are not Communists, nor are we connected to any political party. We were told that that would not be a problem and indeed it wasn’t. We received nothing but warm hospitality, from very friendly fun-loving people. This was certainly in contrast to images of street-protesting Hard Left elements in the UK, who come across as being very angry at the world. I didn’t experience any of that at the UZ-Pressfest. It was a professionally organised huge family-friendly festival. There were considerable amounts of top quality German beer but there was absolutely no sign of excessive drunkenness. Yes, 2016 has been fascinating: the year of centenary commemorations of Easter Rising and the Somme. 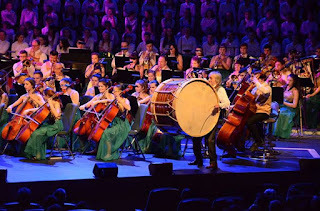 It started off for me on January 1st playing Lambeg drum at a ‘Peace Proms’ concert in Dublin. 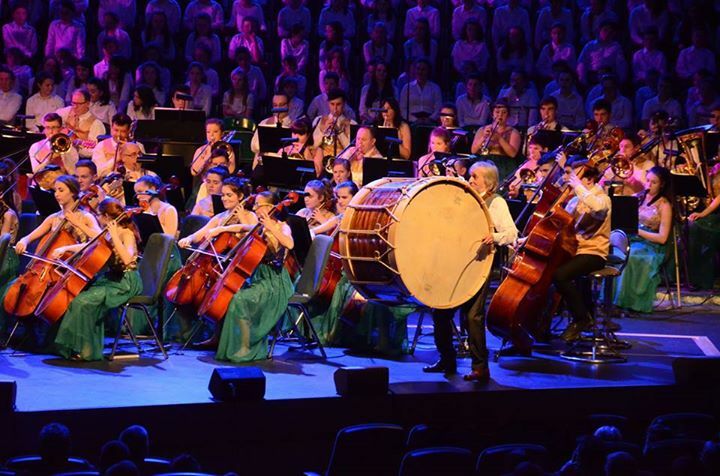 Peace Proms: New Years Day, Dublin. That set the scene for other positive centenary commemorations across the island of Ireland: including Croke Park and Cavan Town. I also participated in St Patrick’s Day celebrations in Belfast plus lots of our usual Ulster-Scots Concerts, including an excellent event, in the spectacular setting of Stormont Castle, organised by the TUV [Traditional Unionist Voice]. 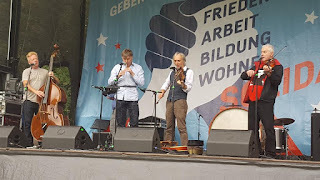 When we returned from Germany our first gig was a very pleasant event to celebrate the 40th birthday of the Ulster American Folk Park in Omagh. After that it was a series of concerts related to the ‘Twelfth’ and the commemoration of the Battle of the Boyne in 1690 [this is the cultural tradition that I celebrated as a child and ever since]. With my folk band I performed in front of thousands at large events in Portadown, Kilkeel, Randalstown and Belfast. Our performance on July 12th in the grounds of Belfast City Hall was a bit different from the rest. In an attempt to normalise the Twelfth in Belfast and to make it more accessible to the wider community, tourists and visitors, we were engaged along with the Belfast Circus and food artisans connected to Food NI. We performed immediately after the Orange parade to a large enthusiastic crowd made up of locals and visitors. Among the visitors from different countries were several who had travelled up from the Irish Republic. 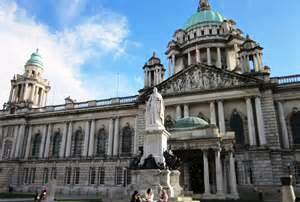 Most of our Ulster-Scots repertoire was not contentious in anyway, except perhaps to a small minority who crave offence. We didn’t have a set list but I did spontaneously decide to sing a couple of verses of The Sash, which some do consider controversial. This was to get the message out that this song is really about an Ulster Orangeman celebrating the Twelfth in Glasgow by singing and dancing – it’s not meant to be offensive to anyone. The diverse crowd seemed to appreciate this or at least they thought it was just really a good rousing piece of music. Our last number that we did was the Lambeg Rant and this facilitated one of the highlights of the day for me. The song, followed by a tune on Lambeg and fifes, is a light hearted effort: suggesting that you don’t necessarily need to do drink or dope as you can get natural highs by playing the Lambeg. No one in the large lively crowd in the City Hall grounds appeared to be under the influence of drink or drugs: until a couple of young men appeared who clearly were. One of them enthusiastically danced and did lop-sided somersaults to our music: he was openly carrying a bottle of Buckfast wine and a bottle of Lucozade. This encouraged me to add a new verse to the Lambeg Rant. We just do the Lambeg drum. At the end of our show, and while I was still saying goodbye to the crowd through the microphone, the young slightly inebriated dancer came up to shake my hand. He said he was thoroughly enjoying the ‘Twelfth’ and that he was a Catholic. He said that they [the Catholics] had their Easter Rising and St Patrick’s Day and we had our Twelfth Day and that was all good. Brilliant I thought: this is what it’s all about. He also pointed out that his cocktail of Lucozade and Buckfast was better known as ‘Lurgan Champagne’. It made me realise that you didn’t necessarily need to be a Lambeg drummer to get a positive high: that you can still manage to fully understand and appreciate the sharing of the human spirit, even on ‘Lurgan Champagne’. At the UZ- Pressfest we did one set on the main stage but mostly we performed on the more intimate stage at the Irish/English section of the festival, which was organised by Hermann and Marion Baur of Derylane Flaxmill, between Dungiven and Limavady [ http://www.flaxmill-textiles.com/index_textiles.htm]. With me were regular band members, John Trotter, Ian Burrows and Davy Angus. We were also joined by the brilliant young Irish harper, Dearbla McTaggart. Herman also joined us on stage to sing with us and to provide detailed translation of our songs to the predominantly German audience. 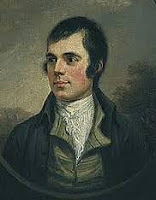 They seemed to appreciate us primarily for the music that we shared with them, but I suppose we further struck a chord with them through songs of Rabbie Burns and my song , “ No Whiskey in the Jar” - which gives a dig to the multi-national corporations and the global banks. I said stand and deliver for youse are the boul deceivers …. But mostly we just hit them with our lively music on fiddles, bagpipes, fifes and Lambeg drum. At this event there were indeed visual political references to Trotsky, Lenin and Marx but the overall atmosphere was of sharing joy and peace: the theme of this year’s UZ- Pressefest was ‘global peace’ and who could have any problems with that? The other constant theme was ‘solidarity with the workers of the world’ – and again, apart from those who exploit workers for personal greed, who could have a problem with that? For some it might be difficult to get their heads around performing for such diverse audiences as German Communists, or Ulster Protestants and Catholics, or Ulster Unionists and Irish Nationalists. But beyond ethnic differences: beyond ethical and political viewpoints, there can be found a common bond in humanity when minds and hearts are open. “It’s coming yet for aa that, that man tae man the warld ower, shall brithers be for aa that”.